Everyone loves an all-suites hotel! 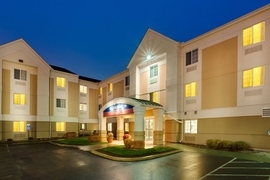 The Candlewood Suites offers more to your stay than the typical hotel room! Upon entering the hotel, you'll notice both the indoor and outdoor space designed for hanging out, complete with grills and a pool. After receiving your room keys, you'll find that the suite not only means larger space, but more to do with the space you have! The studio suite includes a bedroom, bathroom, sitting area, and fully equipped kitchen. The kitchen includes a full-sized refrigerator, microwave oven, stovetop, dishwasher, pots, pans, utensils, plates, and glasses. Don't let your dinners spoil in your refrigerator at home; take them with you and feel right at home as you save money by eating in! If relaxing is more your style, you'll find extra space to stretch out in the sitting area. There is also free high-speed Internet. Come experience the Candlewood Suites today!